We are down to the business end of the NHL, the Playoffs, and it already looks like the Stanley Cup is staying in Chicago. 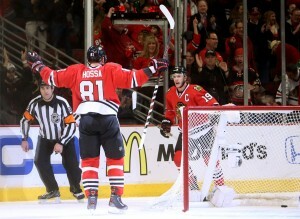 The Chicago Blackhawks, although tied 2-2 against Western Conference rivals Minnesota Wild they look quite strong. Considering Betfair have the Blackhawks at evens to win the conference we can assume that the Blackhawks will be progressing into the final four. The Blackhawks are the favourites with www.betfair.com, thanks in no small part to their victory over St. Louis Blues in the first round. St. Louis have been one of the most consistent teams in the league this season, only three teams can better the Blues’ 111 points total. To come through the first round relatively comfortably against the Blues, they won 4-2, suggests that the Blackhawks are building momentum and if they are, expect them to be more dominant this year around than they were in 2013. Then moving on into the second round, the Blackhawks absolutely dominated the Wild in the opening two playoff games, winning 5-2 and 4-1 respectively, although the Wild did win the third and fourth games to restore parity. But a couple losses aren’t going to hurt the Blackhawks, it actually allowed them to rotate in some fresh players. When your opponent has such long odds with Betfair you can allow for changes, such as the Blackhawks have. We haven’t even discussed the talent that Blackhawks roster possesses, which is simply incredible. Take their defence, which includes Nick Leddy, Duncan Keith, Johnny Oduya and Niklas Hjalmarsson, it is simply impenetrable. While their attack is the most productive in the NHL right now, their total of 267 goals is simply unbelievable. As long as these players are on point, which they should be every game, the Blackhawks simply have too much fire-power to be stopped. Without taking anything away from the Wild it will be Chicago vs. LA Kings in the Conference Final, presuming that the Kings beat Anaheim, for the Western Conference title and that will probably be the Windy City residents’ hardest game. The Kings are just behind the Blackhawks in Betfair’s Western Conference playoff betting. Chicago should prevail because they are the best team in North America right now and when they are on, they are on. Once in the final all their experience will pay dividends. Factored in with their unrivalled attacking strength and a defence to be envious of, Chicago cannot lose. 2014 will see the Blackhawks lift their sixth Stanley Cup.